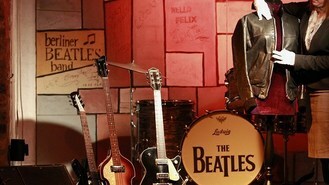 The black jacket, which was bought for £110,450 by a private collector, dated from the Fab Four's stay in Hamburg in 1960, appeared in many early Beatles photographs and was frequently worn on stage between 1960 and 1962. Harrison's 1964 custom-made leather "Beatle" boots, valued at more than £10,000, were snapped up for £61,250 and an orange Western-style shirt identical to the one worn by Harrison during the 1971 Concert For Bangladesh sold for £23,750. A guitar used by Sir Paul McCartney in the 1950s, before the Beatles formed, went for £43,250 at Bonham's in Knightsbridge, central London. Rock memorabilia relating to Eric Clapton and Ginger Baker, The Who, Led Zeppelin, The Rolling Stones, David Bowie, Queen, T Rex and U2 were also sold at the Entertainment Memorabilia sale, which amassed a total of £624,619. Prices include the buyer's premium.